Tea Forté is the global luxury tea Brand identified around the world as the ultimate tea experience. Known for the variety and unparalleled quality of handcrafted teas, Tea Forté re-imagines and re-defines the contemporary tea experience by delivering a delighting and luxuriant encounter. A cup of Tea Forté is unmistakable – all it takes is a glance at their innovative, elegant pyramid shaped infuser, the hallmark of the brand. Remove the overwrap paper and behold the exquisite great gift of the leaf. Placed into a cup, the handcrafted pyramid infuser is designed to allow the delicate leaves to luxuriantly unfurl in the hot water, offering up their complex characteristics producing a deliciously aromatic, flavorful cup delighting all the senses. Tea Forté is the exceptional tea experience. This handsome tea chest contains an expansive collection of 40 pyramid tea infusers, two infusers each of: Earl Grey, Orchid Vanilla, Ginger Lemongrass, English Breakfast, Chamomile Citron, African Solstice, Black Currant, Formosa Oolong, Citrus Mint, Jasmine Green, Bombay Chai, White Ambrosia, Sencha, Estate Darjeeling, White Ginger Pear, Raspberry Nectar, Green Mango Peach, Hazelnut Truffle, Lemon Sorbetti, Blueberry Merlot. Two infusers each of: Earl Grey, Orchid Vanilla, Ginger Lemongrass, English Breakfast, Chamomile Citron, African Solstice, Black Currant, Formosa Oolong, Citrus Mint, Jasmine Green, Bombay Chai, White Ambrosia, Sencha, Estate Darjeeling, White Ginger Pear, Raspberry Nectar, Green Mango Peach, Hazelnut Truffle, Lemon Sorbetti, Blueberry Merlot. Chamomile Citron, Raspberry Nectar, Ginger Lemongrass. A cup of Tea Forté is unmistakable – all it takes is a glance at their innovative, elegant pyramid shaped infuser, the hallmark of the brand. Remove the overwrap paper and behold the exquisite great gift of the leaf. Placed into a cup, the handcrafted pyramid infuser is designed to allow the delicate leaves to luxuriantly unfurl in the hot water, offering up their complex characteristics producing a deliciously aromatic, flavorful cup delighting all the senses. Tea Forté is the exceptional tea experience. 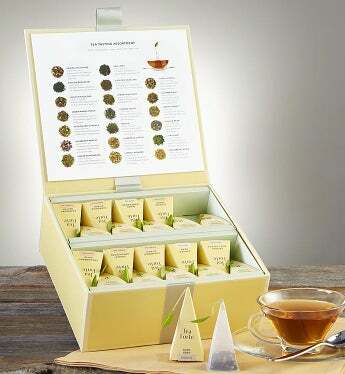 This Sampler Ribbon Box showcases 10 of the most sought after varieties, in black, white, and green teas.